NEREJ – Westport, CT. A team of three brokers, David Lindland, Franco Fellah and Matthew Keefe, has completed the sale of the 201 Main St. property for $3.25 million. HK Group was the only broker involved in the transaction. The seller was the estate of Anna Nappa. 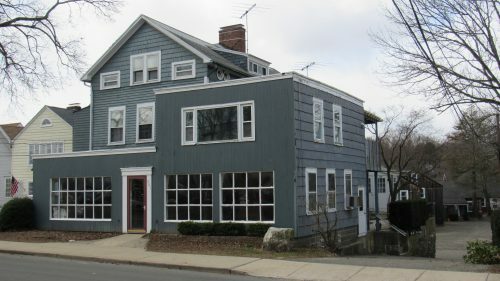 According to ownership, they purchased the property around 1964: at different points in time it was the home of Violet Antiques and Alfred Heckman Distributors. Eventually was occupied from 1971 and up to about two years ago, by Nappa Sales, doing general glass and screen repairs, selling windows, doors and glass. The property contains 13 residential units and a retail store. The new owner, Belden Place, LLC has plans to redevelop the property with 14 apartments and a retail store. Three of the apartments will be classified as affordable. The property features three separate buildings totaling 10,050 s/f, on 0.39 acre zoned restricted business district. Keefe, Lindland, Fellah, 201 Main St.